It is a single floor house design. It is budget house design adding the contemporary features in it. The cost of contemporary style house is cannot be affordable to common people but we can make such houses with in the specified budget. The single floor house included all the amenities needed for a middle class family. This is a one of our previous work. Making beautiful and budget house is our focus. After discussing the likes and dislikes of the client the blueprint of the house is made after that feasible ideas are included and to make budget house. Most of the people thinks that most modern houses are need higher amount of money. But we can construct beautiful house within the specified budget. Total build up area of the house is 1155 and ground floor of the house is 975 and 180 sq.ft is allotted for the further expansion of the house. The interior and exterior of the house is elegant. The exterior of the house is creating a good impression in the minds of the people so it should be attractive and cost saving. Too much amount of money is not needed for exterior and interior designing. It is a two bedroom house design. The master bedroom is attached with toilet and inbuilt shelves. And another bathroom is also attached. The most significant place of the home is kitchen. So the designing of the kitchen is also well organized. There is kitchen with store area. There is upper living area with concept of future expansion of the house. There is well organized wash area. The each and every part of the house is made with good plan and effort s we can control the cost of construction of the house. 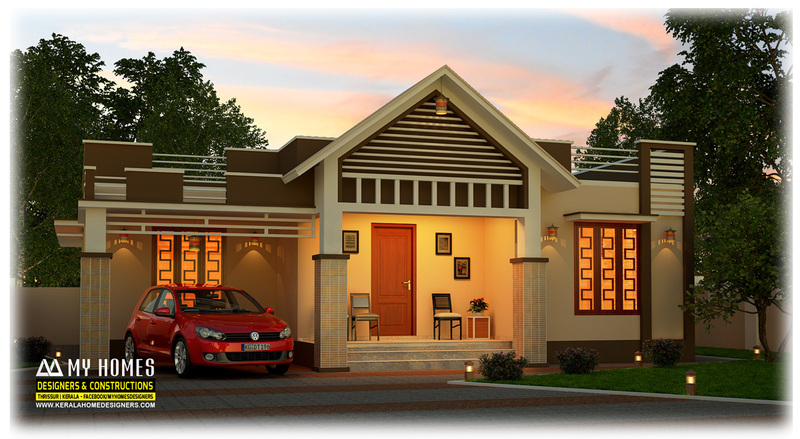 Kerala low budget house design for making beautiful house. Most of the people think that the budget home cannot carry the modern features but we can such house within the limited budget. The interior and exterior of the house is made in the constraints of the budget. The designer can make good designs with the likes and dislikes of the clients. He can add or remove such opinion of the clients that is not workable. Feasible ideas can make the house beautiful and does not exceed the cost limits. Kerala low budget house for budget home makers leads you to take a good decisions and make your dream home more attractive without over cost.